Did you know, that as an author you can earn money when your books are borrowed from public libraries? To qualify you have to register your books with www.plr.uk.com. Signing up doesn’t cost a penny. Payments are made on an annual basis, based on loans data supplied from a sample of public libraries in the UK. There is a minimum threshold of £1, up to a maximum of £6,000. Out of more than 23,000 recipients, only 313 authors received more than £5,000, and more than 16,000 authors did not meet the £1 threshold. The vast majority of recipients received less than £100. Your PLR rights carry on for the rest of your life after you have registed, and for your estate or descendants for 70 years after your death. Over 23,000 writers, illustrators, photographers, translators and editors who have contributed to books lent out by public libraries in the UK receive PLR payments each year. But compare that 23,000 to the amount of books published, and it seems that there are plenty of authors unaware that Public Lending Right exists! It might not seem like much, but it’s money that you are entitled to for your hard work, and it doesn’t cost you anything to apply for it. You can also register for other payments for use of your work from the Authors Licensing and Collecting Society. For a one-off joining fee of £25 – deducted from any future royalties – you can collect payment for various secondary uses of your work, such as photocopying, scanning and digital transmission, and also foreign public lending rights from Austria, Holland, Belgium, France, Spain, Germany, Estonia and Ireland. It might not work out at much, but if you’re entitled to it then why not? It’s just recognition for the contribution that writers make to public culture. It’s hard enough trying to make it as an author – only people like Anthony Beevor or Max Hastings are making millions – so anything that you can get to cover your costs can’t be a bad thing. 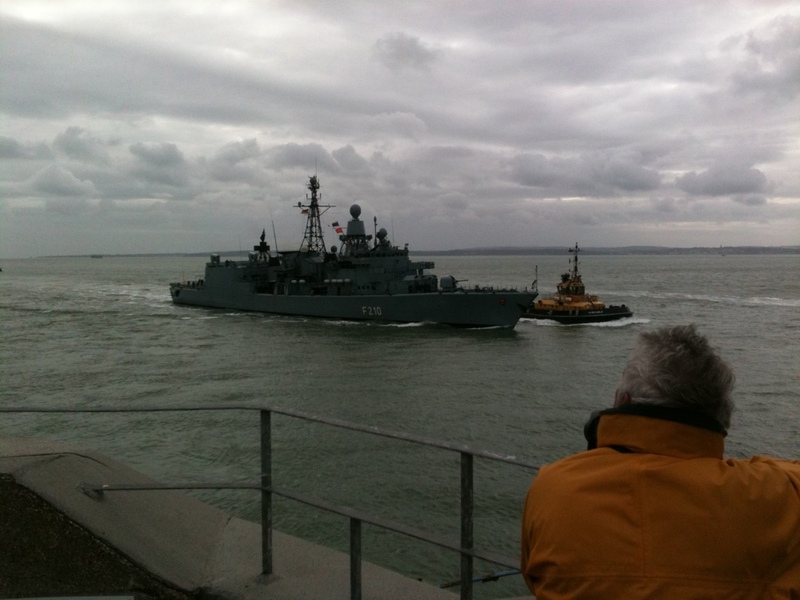 German frigate FGS Emden, which followed the FGS Frankfurt am Main in to Portsmouth earlier today. Also visiting is the Destroyer FGS Hessen. 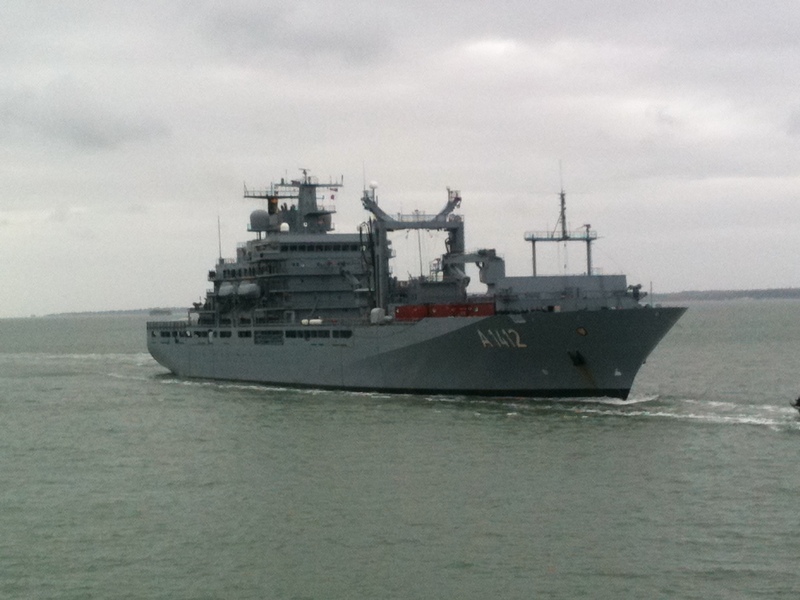 German Navy auxiliary FGS Frankfurt am Main, just spotted entering Portsmouth Harbour. I’m sure those of you who live in the UK have heard all about the never-ending increases in train fares, which have continuted with another hike from this week. My weekly train fare from Chichester to Portsmouth is now £28.90 – that’s an increase of £2.10, or almost 8%. For a journey that takes an average of 25 minutes. At a time when the cost of everything – food, energy, etc – is going up, and wages are standing still or worse going down. I now spend more on train travel to work than I do on food each month. It’s not even as if we get a decent service for it. Most mornings I board trains that are overcrowded, with no toilets, and seats that seem to have all the padding of one layer of cardboard. 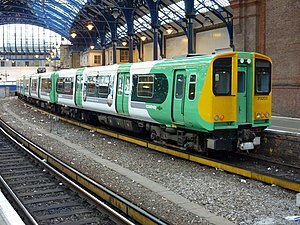 The trains being used on the Brighton to Portsmouth line are often renovated Class 313 rolling stock (seen above), which are actually over 35 years old! So much for our inflated fares paying for investment… I think we are quite entitled to ask where our money is going, and how huge increases can be justified. If anyone doesn’t travel on trains, I cannot stress enough to not believe the PR that the train companies spout. There are more cancellations, delays etc than they claim, but they use all kinds of ruses to massage their figures. Often, if a train is more than 10 minutes late, or whatever the cut-off time is, it will be cancelled. You will then see the train you hoped to catch zoom past, empty and out of service. Or the train might terminate a couple of stops down from its final destination. And the amount of times I have checked train times online and they looked fine, only to get to the station and find that there are cancellations and delays. Does anyone think they are trying to give them impression that all is well, when in fact it is not? I’ve tried to find out some more about the business behind Southern – my carrier of no-choice – but their website is a complete baffle, and their parent company Govia‘s website is minimalist to say the least. Anyone would think that they don’t want people to know how much money they are making! Only a complete delusion artist would attempt to argue that privatising the railways has been succesful. Sucessive Governments hoped, in a Rumsfeldian manner, that investment would make them blossom, competition would bring efficiency, and with the railways off the Government’s balance sheet, the way would be free for big business to gain. It just hasn’t worked, aside from the ideological arguments. Exposing such a crucial part of the nation’s transport infrastructure to commercial forces has resulted in exploitation rather than investment and improvement. The difference between rail travel in Britain and on the continent is startling. The DB in germany is a model of efficiency – cheap, fast, reliable, clean and comfortable. DB is operated as a commercial venture, but 100% owned by the German government – hence the Government has input into services, fares etc. Apparently, however, there is a deabte ongoing in Germany over privatisation. The example of British Railways since privatisation has to scream one word – DON’T! The Dutch NS is owned by the Dutch Government, and the French SNCF is also state owned. All are vastly superior to the British Rail system. Trains should be a service, provided for people to go about their working lives at the lowest cost possible. The spectre of commuters – many facing years of pay freezes and cuts – facing fare hikes of up to 10% is galling, whilst shareholders earn very nice profits for doing absolutely nothing. I’ve stumbled upon a fantastic collection of programmes on the British Army on bbciplayer, some modern, and some archive. Apparently, unbeknown to me, BBC4 have launched an ‘Army Collection‘, many of which are available to view online. Only, I’m afraid to say, to those of you watching in the UK. But to those of us sitting up in bed suffering from a hideous case of man-flu, its a goldmine! One series I know will be very popular is The Paras, a famous 1982 documentary. There is also a set of 30-minute regimental histories, covering amongst other the Grenadiers and Coldstreamers, the Paras and the Gurkhas. Some of it is a little basic, and as usual with anything Regimental in the British Army, everyone’s own Regiment is of course the best ever bar none. But when you watch the ‘In the Highest Tradition’ programmes, you realise that all Regiments have their own, equally barmy, traditions and claims to fame. I also realise I could never have made an officer – silver service is not my style, give me take-away any time. The BBC have also made available a great set of programmes from the Silver Jubilee in 1977, including the Scots Guards Trooping the Colour on Horse Guards. My personal favourite is the Queen reviewing the 4th Division of the British Army of the Rhine on the Sennelager training area in Germany. It involved 578 tracked vehicles, over 3,000 troops, and 27 Regiments. Incredible stuff, and something we will probably never see the like of ever again – it would be unthinkable to bring together a division for just a review! 3 Regiments of Chieftan Main Battle tanks, 1 Recce Regiment, and 4 armoured infantry Battalions in 432 AFV’s, as well as supporting arms, including Gazelle and Scout Helicopters. Abbott 105mm guns, M109 155mm guns, 175mm guns, Lance nuclear missiles, Engineer AFVs including bridge laying equipment, RAMC Field Ambulances, REME in Armoured Recovery Vehicles, Stalwarts, you name it. Other treats include ‘how to make a Royal Marine officer’, the life of a Household Cavalry Corporal of Horse, the Pathfinder Platoon in training, training in the Royal Marines Mountain and Arctic Warfare Cadre, Panorama behind the scenes at Sandhurst, and the Army in Belize and Borneo.